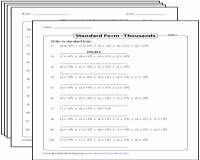 This ensemble of place value worksheets is exclusively designed for students of Grades 2, 3 and 4 to help them convert numbers in standard form to expanded form and vice versa. 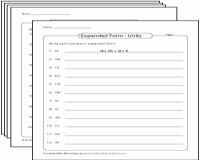 The worksheets are split into place values of units, thousands, millions and billions to enable convenient downloads. A number of free printable worksheets are at your disposal. Convert a mix of 2-digit and 3-digit numbers from standard form to expanded form and vice versa. Transform numbers that contain place values of thousands to expanded form and vice versa. 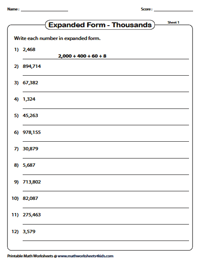 Provide ample practice for young learners with 15 worksheets in this section. Rewrite standard numeric notations that comprise place values in millions into expanded form and contrariwise. 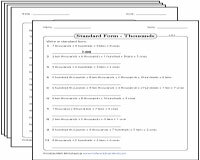 Convert the given multi-digit numbers from standard form into expanded form and vice versa. 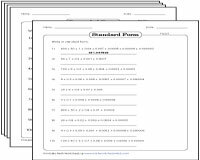 This wide collection of worksheets requires students of Grades 2, 3, and 4 convert numbers into expanded word form and vice versa. 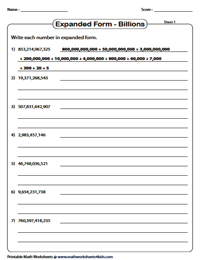 Transform the numbers provided in these worksheets to expanded product form and contrariwise. In product form, the digits will be accompanied by place value multipliers expressed in multiples of 10s. 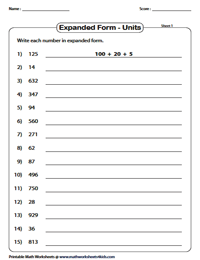 Grasp different ways of writing decimals in expanded notation with this ensemble of worksheets. Learners will need to transform decimals in place value form, exponential form and in the form of unit fractions.